Never heard about this place, until we were already on the van traveling from Calbayog to Victoria. It was the friend we met who told us about this resort (and at that time, he was not yet decided if he’d go with us). So here we were, in front of the ‘Veranda’ where the big signage above declares that it is EWP Island Beach Resort. We were ushered in, and that was the first thing I asked. Why is it that our friend and even the habal-habal drivers kept referring to a ‘Veranda’, when this is EWP Island Beach Resort. Hesumalusep! ‘Veranda’ pala, is the name of their little restaurant by the reception area. Nice place. Well appointed. Obvious that ‘creating’ this place passed by the hands of respectable architects, engineers, probably even interior designers. Not regal nor royal, but cozily elegant enough for a rural setting. Magaling, magaling! Clap clap! Let’s wander about, shall we? This is THE Veranda! Yep, the restaurant/coffee shop near reception desk. Nice place. You can read books, magazines, brochures, or just sit around in this area! Notice the flat screen TV and the outsized speaker on the left. Gosh 'no?! Oh, here's the resort's menu - the reason why many folks call this place "Veranda"! It was mid-afternoon, and our friend asked what local snack can we have. The reply was an immediate and excited "we can cook Sinapot for you". I wondered a bit what "Sinapot" would be, but hearing one of the friends say its good paired with Coke, ah... I already got excited! After a short wait, there came Banana Fritters! Hmm, they were probably already cooking this even before we asked for it. It was fast! They told me that in the past, our forebears would grind rice to powdery consistency, that becomes the coating of each slice when fried. Now, people use commercial flour. Whatever, this thing was a heavenly treat. First bite, I closed my eyes for a moment as it kinda transported me back to years ago when my grandma would cook the same thing for our afternoon snacks, and serve them murmuring protesting why there always had to be Pepsi (for my father and 2 brothers who like it) and Coke (for us who were/are Coke addicts) hehehe! Well, the little bit of difference was, Lola called these "Platanos Fritos" and always had cubed cheddar cheese (or fried queseo) on the side! Anyway... let's go to the rooms, shall we? Room C, our room, good for 6 adults - they call this "dormitory room". So, let's go out there?! Ilang-Ilang Cottage. Just like the one above, an ordinary rural beach cottage, right? But there's more! Though not too clear on this picture, except for the 'windows' (with curtains) everywhere else is "screened" with some kind of a plastic material. Not wire mesh nor chicken wire, green plastic with little holes. Well yes, the underside is clear, and that is where most of the wind comes from, to make the little shack cozily breezy. PLUS, each corner is fitted with a big loud speaker, while on that right corner across the door is a KTV set. All I could say was... OMG! Well, good no one was singing (or would be croaking tonight) as we were the only guests! But, I had to stay away lest I sleep the whole afternoon through. Very conducive! And, this also seems to be the cottage of choice of 2 of the resort's dogs! 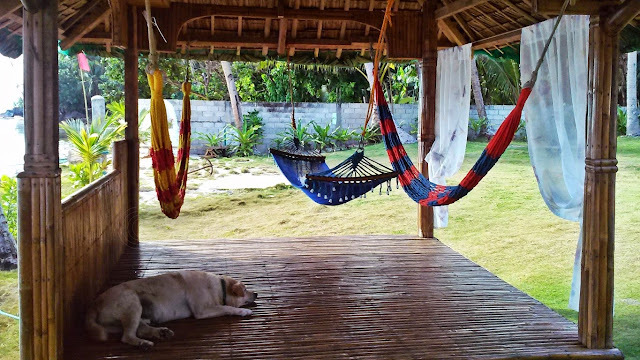 That last one being another 3-hammock cottage, where Bantay prefers to siesta! That last cottage is a few steps to where they keep their boat. Oh they have a boat? And it can also tour you around the island, or bring you to Capul and nearby places. Where's the pool? At opposite end from where I stood, behind those 4 coconut trees! Do take note of this wide expanse of grass (mostly brown due to summer), as this will 're-appear' in the darkness hehe, when I start telling about dinner! Meanwhile, let's go to the beach, shall we?! Okay now, this is why I said "my best may not be yours" over at my arrival story on this island. The sand area is not what many would think as 'the best' like Boracay's. But my travels taught me, that the best unadulterated beaches are those that are still strewn with natural things like seaweeds, rocks and stones. These are not raked away (by some resort crews) because these are part of the natural composition of a seashore, they are part of the ecosystem, and they help maintain 'real life' of a beach itself - so that the water is not yellow-greenish in color! Hey I learned about all these from trusted experts from all over this planet so I believe them. And I see proof, when I encounter one! That is what I thought about this "other side" of San Antonio - unadulterated. Well yes, I am not too impressed with resorts making walls (rip-rap) on the beach. Anyway, on closer look, the real sandbase on this strip of beach is fantastic real fine. But I did tell one of the crews they should avoid removing the little stones. Let it be! See?! Like I did, Bantay (that's his name) & friend likes the sand just the way it is! Hey, I think these dogs are amusingly rather too healthy than should be, aren't they?! Oh there's even a third hairy fluffy one. A toy dog, bigger than a shih-tzu, but as cute just the same, though I never saw it going in the sand! Sosyalerang aso hehe! Water here so clear and placid. I used just a lowly Fuji point-and-shoot here! A baby star-fish. Saw this near a baby sea-urchin about the size of a pingpong ball! Yeah, we flipped this starfish to see the so many moving 'things' on its underside! And those are my friends "walking around"! Wasn't this such a nice afternoon stroll? Of course there were 'ohs' and 'ahs', even a shriek or two as we explored the seabed! Back on shore, another treat awaited. Whipped up by our friend/guide and the manager of this resort - who incidentally was his student at, ah read the shirt hehe! On the right is "Iba Shake". The fruit is called "Iba" in the Visayas, Kamias in Tagalog, Bilimbi in many countries, "Cucumber Tree" or "Tree Sorrel" in English. Oh ha?! That was something new to my eyes, ears, tongue and nose hehe! On the left is one that is even more perplexingly quite a discovery for me! All I can say is "move over Vanilla Ice Blended" (that's the only coffee I have been known to have drank and enjoyed). A better-tasting alternative that costs just about 7% of what I would spend at CBTL! This rip-rap is a usual path of the doggies, but they avoided when they saw things! The nearer island is Capul, the little haze on the right is Matnog, Sorsogon (already)! That is Capul, its entire length. And, hmmm... why not coconut, right?! That smaller island far beyond is San Vicente. Hmmm too! Okay, listed! Okay Capul, see you tomorrow! And as we walked towards our Room C, the crews asked where we wanted to have dinner. At first I thought of their question as as if they were asking about places - like if we would like to have dinner in their resort (at The Veranda), or some restaurant in other parts of the island (if any), or probably another resort (gosh, we'd go habal-habal in the dark?). Ridiculous things already started running through my lowly brain... Good I was not the one who answered them. Because I found out, they were only asking at which area of the resort we wanted our dinner served - The Veranda? The cottages? Which one of the 7? Our room? The poolside? The beach? Ganun! When I looked up, oh hey Mr. Moonie-moon Dela Luna was already up and about! So, we liked chorused "dinner in the very middle of the grass lawn! I asked you earlier to remember that picture with the big grassy lawn in the middle, right? This is it! Without any questions, the resort's crews obliged when we said we will have our dinner in the very middle of it! Whoa! We were in the room, it was already dark, so we did not really see how they did what they did. But when someone knocked on the door to announce dinner was served, oh my lalalalala! A candle-lit dinner table al fresco, in the middle of the grass! Yeah, under the moon and the stars! Yep, nice table set-up, I can't imagine how those kids whipped this up that quickly! And the fare was simple everyday foods - just awesomized! Like what did we really have for me to say "awesomized"? Well, how about this mere malunggay (horseradish) for a main veggie fare?! Carry?! I am not even a fan of any kind of 'halaman' on the table, but I digged this one. I think I finished most of it hehe! They just cooked it with thick coconut milk (tuno in waray) and anchovies (bolinao) - yumminess! There was also this ordinary-sounding grilled pork belly (liempo)... I don't know what they did or placed in it that it tasted interestingly different (manamis-namis) with the meat well done to sometimes burned on the fatty outside, but still tender and juicy inside. Pro! And then there was this 'whateverized' (I don't know cooking terms) Camote Tops! Again, I am not a fan of anything 'halaman', but this salad-like preparation / presentation did cause me to dive into it with gusto! Then this lowly GG! Yep, galunggong LANG, maliliit pa! But it tasted well grilled! C'mon, this was their only fish as they did not expect guests tonight. Ah, the benefits of living in a fishing village, they buy what they need when needed! I joked that the galunggong was actually their (crews') dinner, and they said yes! Finally, first time I encountered grilled pusit stuffed with carrots and other things! Mama mia ang sarap. The friend did tell me that this style of grilling (rare, not well-done) is only good with really fresh squid especially this size. And they told me that this thing was still alive when bought this afternoon. Well, it tastes like a real squid (milky), not soy sauce or margarine or catsup as you would usually have elsewhere! Hah! What can you say about 'more than 3 cups of rice'? That's what I had. For dinner hehehe. And they have Coke! Burp! And they also have SanMigLight! Ah, the life!!! I'll tell you the 'probable' reason why we had such a fantastic fare with a few simple foods they had in their kitchen (we came without reservation, remember?). These kids, yep the crew, all young and eager, were actually students of the friend/guide over at TESDA! So they naturally showed-off what they learned! No wonder the friend kept darting from us to the kitchen, even while those coffee and iba-shake were being concocted! I think he coached them through. Outstanding Miguel, outstanding! Oh ha, we even also flew sky lanterns! Yeah, one friend bought those in Calbayog. Supposedly a 'pasalubong' but the sky was too temptingly clear, so we let them off to the moon hehehe! Breakfast - at another location, still in the wide grassy area of the resort! That, before we sailed on to Capul Island. That's next!